Yoga literally means to link with the Supreme. Yoga is often thought of as a form of physical exercise, but its bodily sitting postures, asanas, are just the first part of an ancient system of meditation. The yoga system was originally meant for realizing God, and all varieties of yoga practice are supposed to bring one to that point. Success in yoga ultimately depends on quality of consciousness and the good wishes of the Supreme Person, rather than on our own gymnastic endeavors. The yogic asanas, breath control, and withdrawal of the senses are meant to help pacify the mind so that one can focus all attention on the Supreme within. Krishna gives His view of yoga practice in the Bhagavad-gita. Since the ultimate goal of yoga is to revive our relationship with the Supreme, anyone in constant contact with God in a mood of loving service (bhakti) is the perfect yogi. - Addressing some common misconceptions about what yoga means. - one aspiring yogi's life-changing discovery about the nature of genuine yoga practice. - sometimes what passes for yoga can be misleading, to put it mildly. - the three main paths of yoga Krishna gives in the Bhagavad-gita. - No serious study of yoga is complete without hearing what Krishna has to say on the subject. - The yoga most people are familiar with isn’t meant for everyone. In fact, in this age it’s hardly possible for anyone. "The word yoga means 'link.' Any system of yoga is an attempt to reconnect our broken relationship with the Supreme Personality of Godhead. There are different types of yoga, of which bhakti-yoga is the best. In other yoga systems, one must undergo various processes before attaining perfection, but bhakti-yoga is direct." "The yoga system, as described in Srimad-Bhagavatam and Bhagavad-gita or as recommended in the Patanjali yoga process, is different from the nowadays-practiced hatha-yoga as it is generally understood in the Western countries. Real yoga practice is to control the senses and, after such control is established, to concentrate the mind on the Narayana form of the Supreme Personality of Godhead, Sri Krishna." "Of all yogis, he who always abides in Me with great faith, worshiping Me in transcendental loving service, is most intimately united with Me in yoga and is the highest of all." "Perform your duty equipoised, O Arjuna, abandoning all attachment to success or failure. Such equanimity is called yoga. " "Krishna tells Arjuna that he should act in yoga. And what is that yoga? Yoga means to concentrate the mind upon the Supreme by controlling the ever-disturbing senses. And who is the Supreme? The Supreme is the Lord. . . The following of Krishna's dictation is real yoga, and this is practiced in the process called Krishna consciousness." "Yoga means concentration of the mind detached from all other subject matter. And actually such concentration is samadhi, or cent percent engagement in the service of the Lord. And one who concentrates his attention in that manner is called a yogi." ". . . realization of the personal form of the Lord is called the perfection of yoga. After practicing the sitting postures and other regulative principles of the system, one finally reaches the stage of samadhi—absorption in the Supreme. In the samadhi stage one can see the Supreme Personality of Godhead in His partial form as Paramatma, or as He is. . . 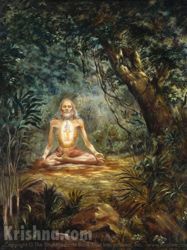 The yoga system described in the books of Patanjali is authoritative, and the modern so-called yogis who have manufactured their own ways, not consulting the authorities, are simply ludicrous." Can we use yoga methods to develop more concentration in chanting? Isn't yoga the most spiritual form of exercise? What are the other types of yoga explained in Bhagavad gita? I've read something about bhakti yoga, what kind of yoga is that?